Our vision is to assist in the provision of educational resources for children and youth. Streets to Schools strongly believes that education is a fundamental right with the potential to secure more equitable access to future economic opportunities that contribute to halting intergenerational poverty. We also work collaboratively with women through local initiatives to improve their unequal socioe-conomic status in society. We plan on hiring local labourers which will help them financially provide for their families in the local community while stimulating economic activity within the community. Purchase the necessary materials for the construction. 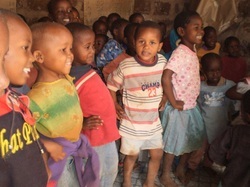 We will be sponsoring 14 of the children at Njiapanda Street Children`s Centre to be enrolled at Himo Primary School and Dr. Shen Primary School for one year, beginning in January 2012. The fees per child include tuition, school uniforms, school supplies, and lunch. The remaining toddlers will continue to receive early childhood literacy skills in the newly built learning environment by a retired, certified teacher. Every Sunday, the teacher and Mama from the centre gather approximately 25 women together to provide lessons on handbag weaving. The average handbag takes 2-3 days to complete and are sturdy enough to hold 20 lbs of goods. Fair trade handbags not only provides these women with a source of income, but also a valuable skill set that can be passed on to younger generations.